It was the baking group again today, though they were slightly thinned out by holidays. It’s always good to see them because they are a happy lot. This is good when you’re baking (as some of my attempts have been horrendous and several, despite exhortations to “re-use the dough” have ended up in the bin – sometimes scraped from my fingers, and sometimes propelled with at speed). The fact that Focaccia was bread of the day was a bonus. It always smells so good. I wasn’t baking today – I lost my baking mojo a while back and my enthusiasm has faded. I need to start getting it back now, particularly as several schools have been asking for bread making as an option when they come to visit. The smell of freshly baked focaccia and rosemary is just the sort of thing to bring back that enthusiasm. Not that I’m overly enthusiastic about the school sessions – it can be a bit of a dull day for the kids when you keep dragging them back into the kitchen for the next stage. That reminds me, I have a teacher to ring back. 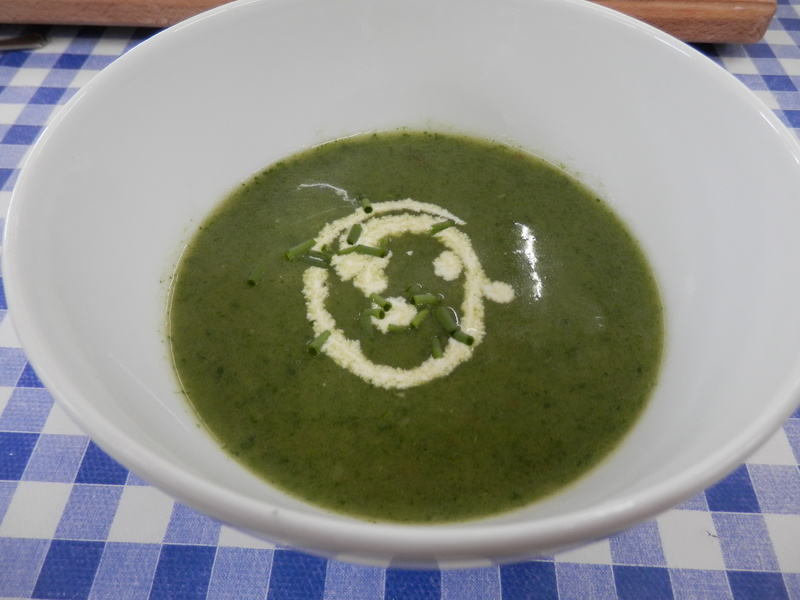 At the end of the session I gave out nettle soup. One or two slunk out without taking any (though I bear no grudges) but several drank it cold there and then and the rest took pots home with them. I’m easy with foraging and can take it or leave it, but it’s good to produce food from found ingredients and to introduce people to new experiences. It’s also, as somebody once said in a book, good to eat foraged food once in a while because it gives you a range of nutrients. However, there are reasons that we eat spinach instead of nettles, with the stings being just one of them. I have actually set myself a target of learning something new every day this year. My learing for today was that I didn’t know how to spell focaccia. In fact I just had to check it after writing that. Finally, can anyone tell me how ro swirl cream into soup and have it still look good by the time you’ve switched your camera on. In an effort to raise my game last night I swirled the cream, sprinkled the freshly picked chives and took this picture that looks like a curdled face. 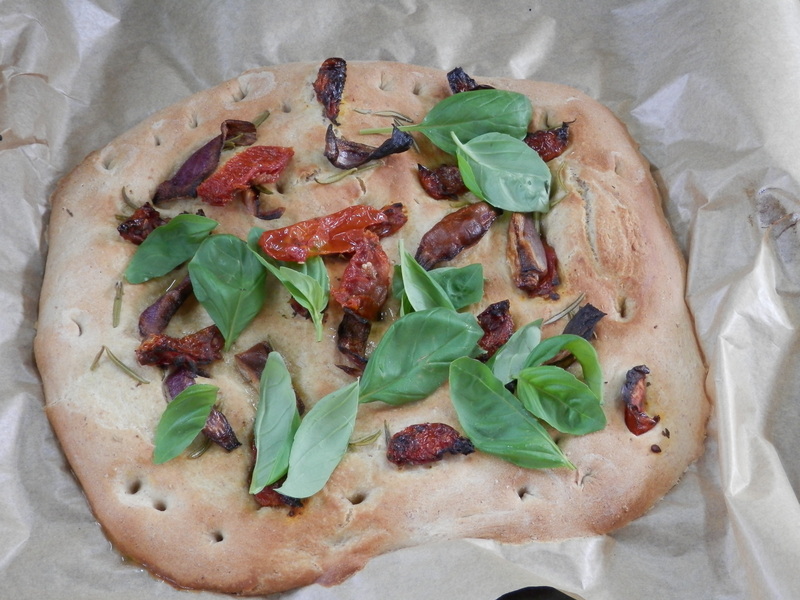 This entry was posted in Care Farm, Cookery and tagged bread, eating weeds, focaccia, foraging, home-made soup, nettles on April 30, 2015 by quercuscommunity. We had a red-legged partridge at the bird feeding station yesterday. They can tell when the shooting season is over and gradually begin to appear around the yard mooching for spilt grain and chicken food. We’ve not had one by the feeder before so it’s a first for the list. The grey partridges they reared for the shoot all disappeared by last autumn and everyone thought they had wandered away or fallen prey to predators. However, since the end of the shooting season we have started seeing them again. They have a brain the size of a pea. They have no formal education. But they seem quite intelligent to me. This entry was posted in Bird Watching and tagged bird feeder, partridge, shooting on April 29, 2015 by quercuscommunity. We had twenty kids out today to discuss plant growth, plant seeds for cressheads and make butter. Due to the regulations and fears around taking photos of kids I can’t actually show you a photograph of 29 smiling faces as I didn’t get the right form signed, but believe me – it happened. This was achieved despite the fact that they had been expecting a day out playing on the farm, not the plants growth/sandwich making brief we had been sent. It’s a shame I was only expecting 20. It meant that we didn’t have enough compressed paper pots for cress heads, so I had to cut some egg boxes up. At that point I was told that Pupil X has an allergy to chickens, which includes eggs and anything that once contained eggs. Now, allergies are dangerous, and I’ve been taking some training lately so that we don’t kill anyone in the kitchen, but there is a time and place to be told about allergies. The place is not “here” and the time is not “now”. Time, I think, to reassess our booking procedures, and to look closely at our communication skills! This entry was posted in Education and tagged allergies, Care Farm, communication, gardening, plant growth, plant seeds on April 28, 2015 by quercuscommunity. It’s not often we welcome a sports personality to the group but we did today, after his trip to the Disabled Games at Scunthorpe. So it’s congratulations for a job well done (including archery and curling) and a big thank you to the Rotary Club for putting on the games. Despite predictions of cloud and rain over the weekend we pretty much seem to have had good weather. Too good for the plants in the polytunnel – some of which had laid down and died on heat stress on Sunday. I was in on Saturday so I know all was well then. Current forecast indicates we are in for some cooler days but they haven’t exactly covered themselves with accuracy for the last ten days so I don’t know what to believe. I’ve been ordering a few new seeds as I crave excitement in the garden and don’t think I’ll be getting that from phlox, onions and feverfew. So it’s hello to Giant Bamboo and Bananas. The Giant Bamboo is suposed to grow a foot a day when it gets into its stride so I’m looking forward to that. It’s going to make an interesting photo diary at the very least, and next year’s bean frames are going to be pretty spectacular if it gets anywhere near its predicted 100 foot tall. Final picture is of our new, slightly out of kilter, X-shaped bean frame. 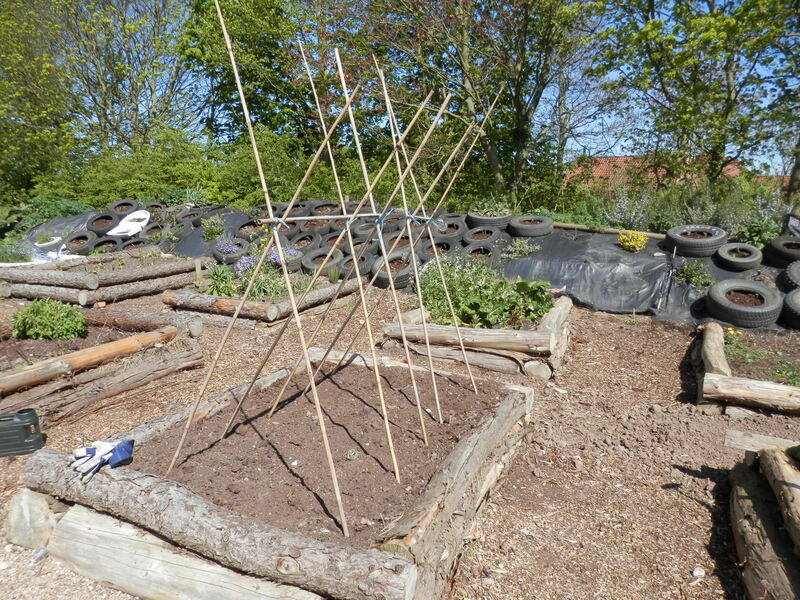 The theory is that the beans will hang down and be easier to pick from an X than from an inverted V. I’ve seen a more sophisticated version of this in a book – I think by Alan Titchmarsh – which was a timber frame supporting a proper V shape. If the X works I may look at going the whole hog next year. More news on the beans is that the roots we saved from last year are starting to form shoots. Normally gardening books tell you to cut the top part off and leave the roots in to the soil so that all the nitrogen they have fixed from the air will go back to the soil. A couple of years ago Julia read an article saying that runner beans were perennials and you could store the roots like dahlia tubers. We did it and they seemed OK. Opinions on the net seem a little mixed but we’ll give them another year and see what happens. 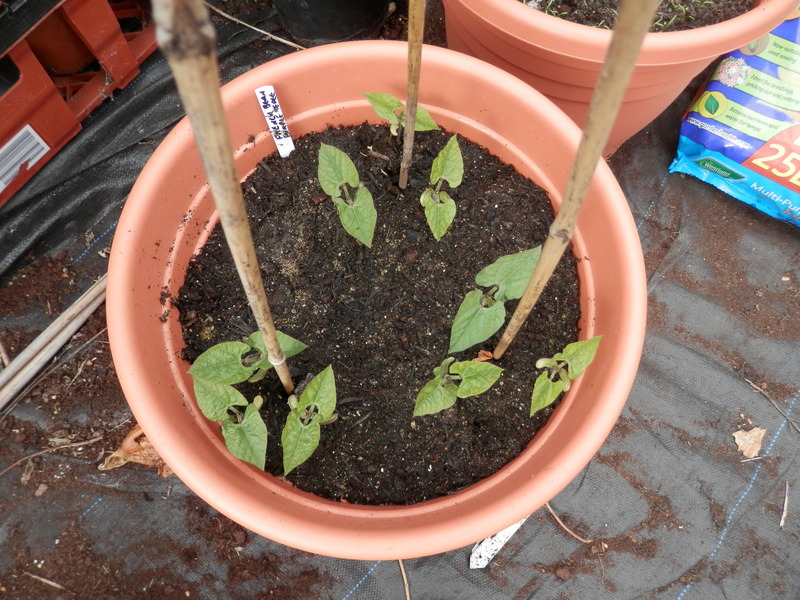 This entry was posted in Gardening, Green Care and tagged Alan Titchmarsh, bamboo, beans, disability games, disabled games, learning difficulties, nitrogen, runner beans on April 27, 2015 by quercuscommunity. You wouldn’t think one small woman could contain so many orders but by the time she’d finished I had a list big enough to see out my Saturday, which is why I’m sitting down at just after four to finish the day. It’s not been the longest of working days, but it is Saturday and a chap expects a bit of slack. That reminds me, I seem to have missed lunch. I knew there was something I’d forgotten. If I call it a diet I can feel virtuous. And hungry. 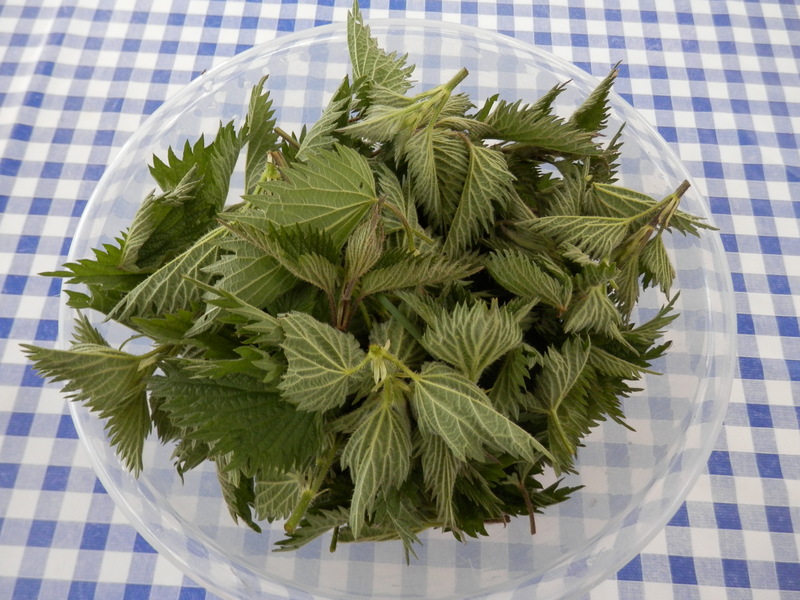 My nettle crop is looking good – enough tops for a good soup and enough mature leaves to start drying for tea. Unfortunately The Farmer and his farmer’s brain have noticed them and told me to eradicate them. This calls for either blackmail or distraction tactics. I will apply my thoughts to the problem. 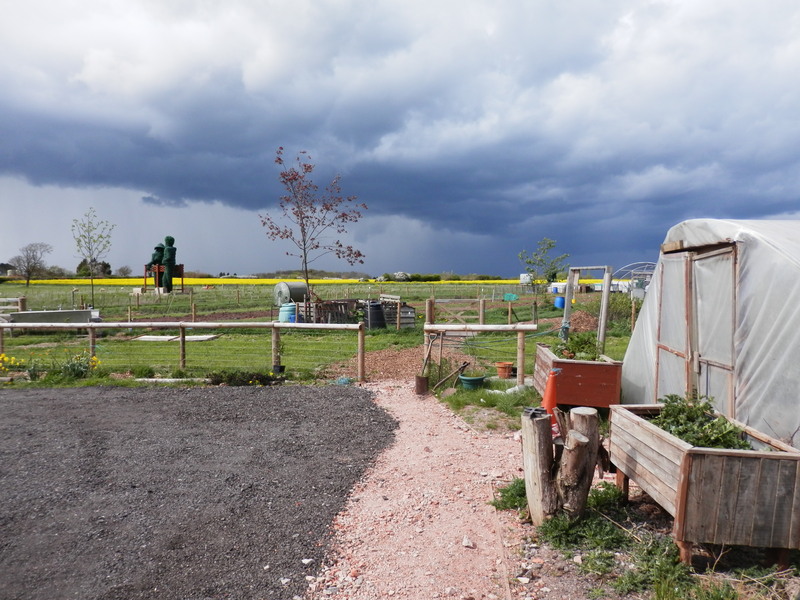 This was the weather this afternoon just before the rain. Not quite as good as it has been and there’s a definite bite in the 25 kph wind – good job I decided not to jump the gun with the planting out. This entry was posted in Care Farm and tagged compost, gardening, nettles, plants, rain, sowing, tea plantation, wife on April 25, 2015 by quercuscommunity. Just look at the beans – they’re a bit different from the picture I took a couple of days ago. However, this isn’t the first time I’ve had good beans at this time of year. It’s not always a guarantee of having good beans later in the season. Last year’s crop, for instance, had to be replaced after cold winds saw the original plants off. Pride definitely goeth before a fall, as I often misquote. There’s something about crops that brings out the fool in many of us. I always used to plant too early anmd suffer huge losses. I’m better now but It’s hard. Same went for my customers when I used to be an agricultural salesman. There were always a few who had to be the first to gather the harvest in. You could always tell them by their smug expression and the sound of the grain drier working overtime. I’m not sure what the profit margin is with grain, but I can’t see the cost of drying improving it. 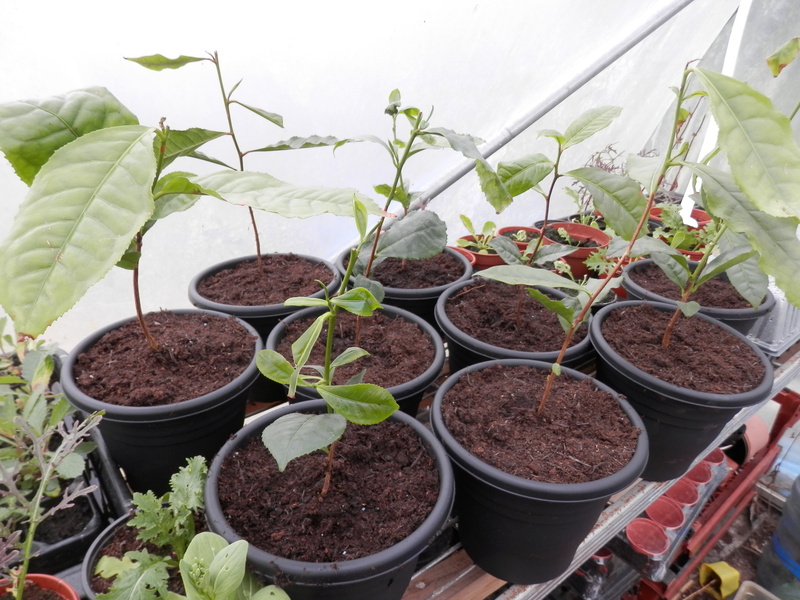 And here’s the tea plantation – or nine sticks in pots. It’s early days yet. If you fancy any I can recommend hot-plants on ebay. They came from Cornwall, were £8.95 each, arrived quickly, and were well-packed. This entry was posted in Gardening and tagged beans, planting times, tea bushes on April 24, 2015 by quercuscommunity. This was the view from the “office” an hour ago. As I’ve often said before, I’m not in this for the money or the glamour. I do it for the people and the view in spring and summer. I actually only say that to make people happy, because really I just do it for the view and the birds. “Solitude sometimes is best society.” as Milton said. For those of you wanting to know more about the film we saw on Tuesday night you can find the first 15 minutes for free on this link. If you would like to show it to a group they are allowing people free licences to show it in Mindful in May. I’m an old-fashioned sort of bloke and don’t go in for all this health stuff, but I ddi enjoy it and there was some good stuff in there, so even if you are a cynic you can still get something from it. That’s the end of the advert, if they want more coverage they write their own blog. On the downside, I have a meeting in a minute where, amongst other things, we are going to discuss the agenda for a meeting next week. Talk about trouble in paradise. This entry was posted in Care Farm and tagged Green Care, meditation, meetings, Mindfulness on April 24, 2015 by quercuscommunity.